As a broader range of consumers discover the golf car lifestyle, innovations continue evolving to meet the needs of today’s buyers. Here, we’ve identified five trends that are increasing in popularity and will continue to shape the way people use their carts into the future. Luxe Materials: We saw more golf cars transitioning into mini-versions of your luxury sedan at this year’s PGA Merchandise Show. More cars are featuring amenities like in-dash A/C and heat, sleek LED headlights and dashboard lights, and hand-stitched leather seats and steering wheels. 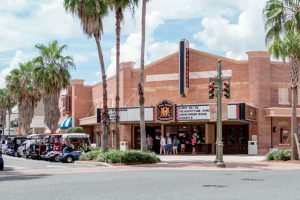 As more consumers use their carts for leisure and social activities close to home, it only makes sense for them to upgrade their rides to include these creature comforts. Energy Savers: Golf cars are already an economical way to get around, but there are more options than ever to increase energy efficiency. As more people are turning to electric vehicles to cut down on energy usage and lower emissions, golf car owners are choosing to buy LED headlights and light bars because they require little power to operate, last longer than halogen bulbs and put out an impressive amount of light. 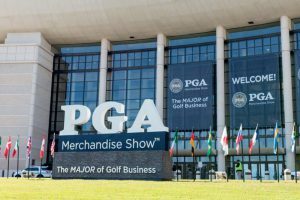 Also included in this trend, solar tops and batteries with increased efficiency and power were well represented at this year’s PGA and GIS shows. In fact, Future Market Insights’ latest report, Golf Cart Market: Global Industry Analysis and Opportunity Assessment 2016-2026, predicts that solar-powered golf carts will be a fast-growing segment due to lower maintenance costs. 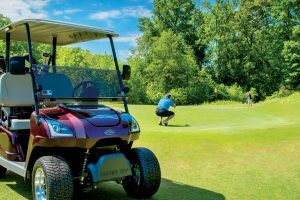 Street Style: With more local laws in favor of golf cars taking to the streets, consumers are looking to customize their rides – especially in master planned communities where a golf car is an extension of personality and a way to quickly identify carts in a line-up. We have noticed a more aggressive street look with bigger tires, wheels with interchangeable inserts and body kits with more rugged, angular lines. Other street-style trends offer versatility when scooting around town, including body extension kits, enclosures and fold-down rear seats. Mobile Technology: As mobile usage surpasses desktops when it comes to surfing the web and coincides with the adoption of smart homes, ways to access and bring along your mobile device has made its way over to golf car products. From Bluetooth speakers and built-in USB chargers to monitoring your golf car’s performance, expect to see a growing list of mobile integrations. Off-Road Options: The line is continuing to blur between golf cars and side-by-side ATVs. 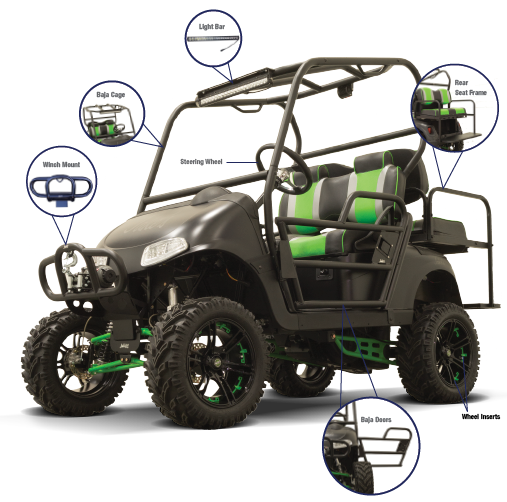 Many consumers are finding they can upgrade their carts with accessories like cage systems, tubular doors, light bars, rugged body kits, long travel lift kits and armor bumpers to create a more personalized and a affordable off-road option for their outdoor adventures. Popular on both the trail and the street, these products are not only designed to look tough, they also perform and provide an easier way to access hunting, fishing and exploring off the beaten path. Are You Prepared for the Future of Low-Speed Vehicles?